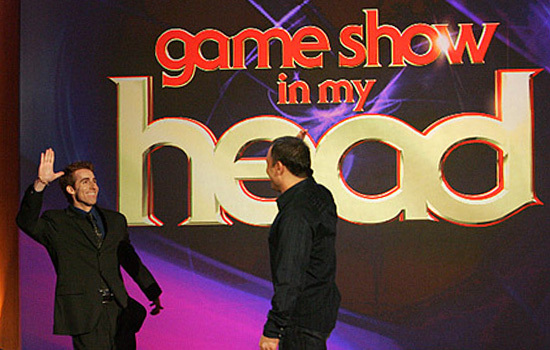 GAME SHOW IN MY HEAD was recently shot for CBS. Produced by Ashton Kutcher, who it is rumored, he bought the idea of the show from a British production company. In-studio screen that shows contestants doing stunts. It’s a new game show that combines hidden camera pranks with game show winnings. Instead of the subject being the one getting pranked, the subject is the show contestant, and they are the ones pulling pranks on unknowing passersby. Contestants have to follow instructions of tasks given to them via an ear piece. Each stunt, or prank that they manage to pull off, they earn $5000. The maximum amount one contestant can win in the show is $50,000. If they win the last challenge, they automatically double their earnings. The show is hosted by stand-up comedian Joe Rogan who also hosted “Fear Factor”. Tapings of the show lasted three days, and that was three days too many for Rogan and the stage manager who did not get along. The two squabbled in front of audience members. Host Joe Rogan (right) with stage manager (left). I attended two of the three days of filming. 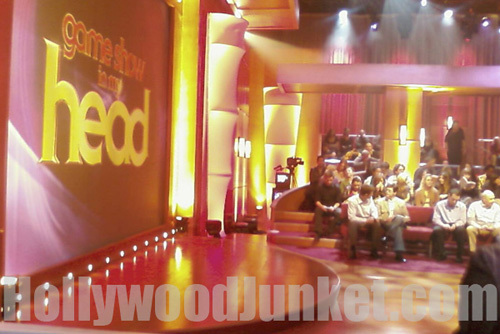 Edited footage of the contestants are shown on a large screen on stage while the studio audience reacts. While the pre-taped footage is rolling, Joe Rogan is speaking his lines that are timed with the edited footage. When the show airs, it will appear as if Rogan is speaking directly to the contestants via their ear piece. However, it is more likely that a team of producers were really instructing the contestants at the time the field footage was shot. Another flaw in the show is that, each contestant is said to have only five minutes to achieve each task, but with the footage being pre-taped along with much editing, it is not certain how long each task really took. The audience is given the illusion that every task happened within five minutes. Contestants go from starting to attempt a task in a unsuccessful way, then suddenly they go about it in a more creative way. It’s as if a producer instructed the contestant on exactly what to do to help the contestant win the task. Other times, the contestants are left out to dry. Joe Rogan even stated to one audience member that one contestant achieved her task after the five minute time limit. The camera crew shot it anyway. But the show did not reward her, instead, faulting her for another time factor. She had to keep three possessions from a stranger for a solid 60 seconds. Again, because of the edited footage, we really have no way of knowing for sure if she held the items for one minute, even though it was irrelevant.